Bionic Commando: Elite Forces was supposedly released on December 31, 1999 (the supposed final hour before Y2K was apparently about to doom mankind), but the copyright screen claims it was released 2000. It wasn’t actually a product of Capcom, but was instead published by Nintendo. It was developed by their internal team NST, an American studio who had previously ported SNK’s NES action-RPG Crystalis to the Game Boy Color. Rather than converting another company’s code, however, they created a completely new game. It was initially only released in North America and Australia, but has since received wider distribution on the 3DS Virtual Console. The story is pretty familiar by this point. The land of Karinia is under siege by the Avar army, their leader Arturus found the Albatross Project, Commander Joe (What? He’s not so Super anymore?) 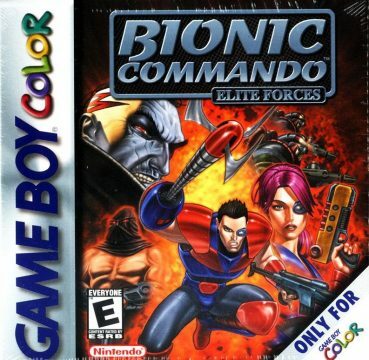 is sent in to stop it, he fails, and in comes the Bionic Commando to rescue him. This time, Rad Spencer is not the protagonist, but you get to name the hero… or heroine. Yep, you get the choice of a male or female character to take into the field. Their differences are mostly aesthetic, but there are a couple of stages that differ depending on which commando you choose. After making your choice, you appear on the familiar map screen with the familiar layout, familiar helicopter, and familiar enemy trucks. Yes, it looks just like a Bionic Commando game should. You may notice, though, that the colors of all stage squares are the same, as opposed to there being one color for Action Zones and another for Neutral. That’s because they’ve abolished the Neutral Zones entirely. Although they served little more purpose than containing integral items, it’s a shame to see them absent. The graphics are something of a mixed bag. The colors are put to use quite well, but then again, it is a Game Boy Color game. In some areas, they appear bright and vivid, but can also be dark and murky. It all depends on the area you’re in, be it an urban cityscape or a mysterious forest. On the other hand, the artistry is quite ugly. The color scheme was likely used to stand out on the non-backlit Game Boy Color screen, but outside of that it looks very garish. Compared to its predecessors (even the original GB title), it just doesn’t look as appealing. The areas tend to get monotonous as well. Back in the NES game, no levels looked the same. Here, you’ll often find three areas sharing a very similar look before moving onto new terrain. At least the sprites are animated quite well. The sound also brings some good and bad, with some of the compositions being rather catchy. The soundtrack is mostly original, with only one of the tunes being carried over from the GB title. Although compositionally it holds up fairly well, the chiptune instruments are chirpy. It sounds like a first-generation GB game, and considering that even the 1992 release sounded much better, the programmers must be chided for not making full use of the sound chip. The effects themselves sound rather muddled, and the digitized voice samples are laughable, sounding very crackly and indistinct. The presentation certainly could have been better, but the action is definitely adequate. The control doesn’t feel as tight as it did in the Game Boy title, but it’s still relatively easy to control. You can even drop down from ledges by pressing Down twice, which is a good addition. At the communication rooms, you can contact your home base or tap into the enemy frequency to receive inside information. Unfortunately, the element of suspense is diminished, as there are only a few set stages where wire-tapping results in an enemy assault. All you get are a couple of standard soldiers, instead of knife guys rushing in while paratroopers fall in until you escape. It just doesn’t feel the same. Still, you can switch weapons and decoders at the communication rooms, and even save. Bionic Commando: Elite Forces runs on a battery backup, allowing you to swing, shoot, rest, and pick up right where you left off. There are also a couple of hidden comm rooms that lead to secret levels, which are real challenging and truly test your prowess with the bionic arm. They don’t really offer anything grand for a reward, just a change of your character’s color and bragging rights. There are a few sniper sections where the view changes to a first person perspective and you need to shoot some stuff. These seem weirdly out of place, but at least they’re brief. Meeting with an enemy truck puts you into an overhead scene, just like the NES game. Instead of moving strictly forward, you’ll have to move left and right to get to the end of these scenes. Destroying the powerful enemy vehicles nets you a bonus life. The existence of the save feature makes continues obsolete, so you get lives instead. You just might need those lives, too, as you can expect to die quite a bit. It’s not so much that the levels are hyper-difficult, but they do tend to frustrate quite a bit. On more than one occasion, you will more than likely swing right into an enemy soldier and take a hit. You can hold Up and Down to get a better vertical look of the terrain, but not much can be done horizontally. It can get a bit infuriating to swing forth into unknown territory and only have a millisecond to grasp onto the next ledge, or risk plunging into the abyss below. There’s just something with Elite Forces that doesn’t sit right. The graphics are garish, the sound is grating, and the gameplay is diminished by the somewhat cheap deaths. 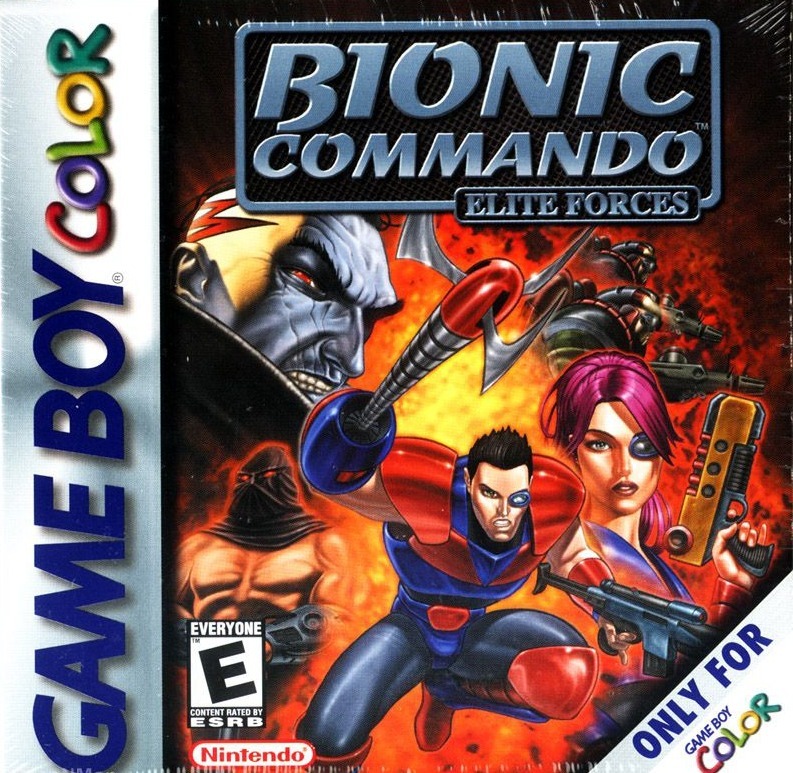 It’s still a Bionic Commando title and it has most of the same shooting and swinging moments that fans know and love. However, it is rather a far cry from the NES game, or even the GB title.